Not the first time the BBC weather department has been caught out. Paul, this is nothing to do with the BBC. Didn't you read the above blog? Oops. You're quite correct DBC. Both the BBC and the Daily Mail can be caught out on occasion obviously. Very true, Paul, but there is a big difference: the BBC didn't realise what was said because it is a colloquialism, while the Daily Mail was caught out because they have decided that the BBC are evil and MUST BE ATTACKED to keep their readership up, without bothering to check the facts or realising how asinine their attacks are. It's why they're currently getting stick on the blogosphere for blindly believing every last word that Positive Weather Solutions say just because they say what the Mail wants, despite being an extraordinarily shady outfit that uses the photos of Russian brides for its staff profiles, and rabidly attacking the Met Office even when their evidence is solid, because they've decided that they're a target for ridicule despite an excellent track record. 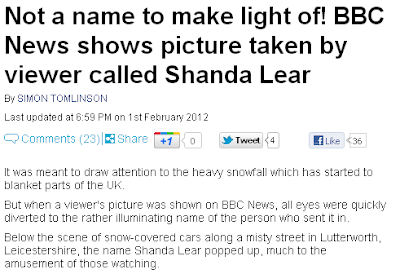 As English is not my mother-tongue, could you explain what's funny about the name Shanda Lear? Is a Chandelier. The word is pronounced "Shanda Lear"